Hi, Readers, and a big welcome to my new blog followers! 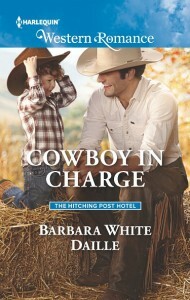 I’m sharing a quick snippet today from Cowboy in Charge, book 4 in The Hitching Post Hotel series. The book just released this week and is available at any of your favorite retailers. You can find more info down below. Just a setup for your snippet: when Layne’s ex unexpectedly shows up on her doorstep, she passes out due to a bad case of flu. And now the man she never wanted to see again thinks she can’t function without him! Slowly, she turned to face her ex-husband again. He had set the dishes in the sink. Hips settled back against the counter, he stood with his arms crossed and his biceps bulging against his T-shirt sleeves and his frown looking too much like Scott’s for her liking. This situation was all too much for her and had been from the moment she had seen him standing in her hallway. I’m blogging at Just Contemporary Romance, where I’ll be giving away books. AND there’s a giveaway right here on the blog. Check yesterday’s blog post for all the details. Good luck, and have a great Sunday! I have these on my wish list. I want the whole series.